Summary: So The Social Network offers a lot to get excited about. It’s a doozy. It’s make or break time for David Fincher. That might seem like an odd thing to say about a director who has, to all intents and purposes, ‘made it’, but hear me out. In 2008, after 15 years of directing some of the most influential and grown-up films to come out of Hollywood, including Se7en, Fight Club and Zodiac, Fincher took his first step into much more family-friendly territory with the lush drama The Curious Case of Benjamin Button. That film became his biggest box-office hit to date, but it also signalled, in my opinion, a distinct compromise of Fincher’s previously established flair, style and ability to fire on all creative cylinders. It looked beautiful, but it was too long, dull and emotionally inert; essentially, Fincher with all his rough edges smoothed off. 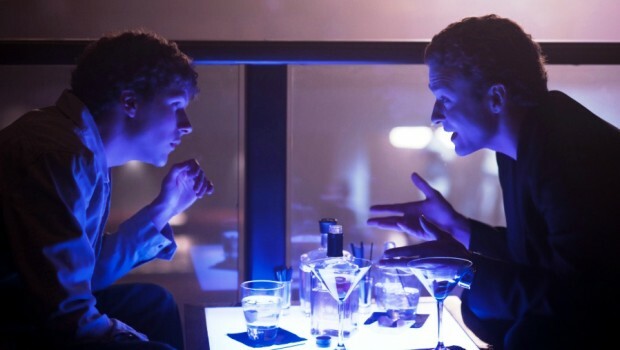 So the release of The Social Network (or “the facebook movie”) is a defining moment for Fincher, as it has the potential to be the film in which he successfully unites his proven ability to delve into the darker recesses of humanity with his obvious desire to make films for as wide an audience as possible. This film’s pedigree is impressive: it’s written by West Wing creator Aaron Sorkin, based on Ben Mezrich’s racy and, by all accounts, not-exactly factual book The Accidental Billionaires, and was first picked up for development by Kevin Spacey, who takes an executive producer credit on the finished film. It’s already being pushed for awards glory by über-producer Scott Rudin, but that’s not necessarily a bad omen; Rudin was the driving force behind some of the best Oscar contenders of recent years, including No Country for Old Men and There Will Be Blood. He clearly knows how to enable, rather than dilute, a good filmmaker’s potential. The film recreates the early days of Facebook by centring on the bitter feuds over who created it; feuds which came to public attention in 2006 through a series of deposition hearings between the site’s founder Mark Zuckerberg and various groups of his former friends and colleagues. Sorkin’s script, which is readily available online, zips back and forth between these hearings and the momentous events of three years previous, when what began as a site for rating the hotness of female Harvard students, set up by a spiteful Zuckerberg, mushroomed into the social networking phenomenon we know today. Several things quickly become clear when reading the script: one is that this is material that perfectly lends itself to Fincher’s detailed, procedural style, most effectively seen in his meticulously assembled 2007 film Zodiac, another is that Sorkin’s trademark quick-witted humour is definitely present, and the third is that this is not going to be a particularly flattering portrayal of Zuckerberg. As written by Sorkin, Zuckerberg is a socially inept, self-seeking twentysomething with a mean-spirited wit and a massive IQ. It’s a gift of a role for Jesse Eisenberg, who has certainly proven his ability to play the awkward geek in a string of comedies (Adventureland, Zombieland). This is his chance to demonstrate a greater range, and I’m hopeful he’ll pull it off. The film’s huge cast also includes man-of-the-moment Andrew Garfield who, as well as being recently confirmed as the new Spider-Man, is also soon to be seen alongside Keira Knightley and Carey Mulligan in Mark Romanek’s London Film Festival opener Never Let Me Go. And if that wasn’t enough, there’s also the little matter of Rooney Mara, the unknown actress who David Fincher recently cast as Lisbeth Salander in his forthcoming remake of The Girl With The Dragon Tattoo. Mara has a significant role in this film too, so it will hopefully be a chance for us to see just what it is about her that Fincher’s been so taken by. So The Social Network offers a lot to get excited about. It’s a doozy.